[ADVERT]If treasure was easy to find there would be no need to follow a faded map to an out-of-the-way location. Still, every so often the map is accurate and there's a real gem at the end of the journey. Such is the case with Industriart. Located at the back of a small factory complex in the industrial area of Bellevue, the bright green building houses a wonderful collection of furniture, jewellery, glassware, antiques and much, much more. 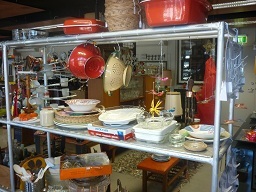 The shop is the creation of a husband and wife team of self-described hoarders. Owner Veronica Di Candilo insists that she only stocks things she likes. For someone who loves the word "eclectic", that includes such things as bright Mexican tin ornaments to caftans to Gauguin-inspired lampshades to tea trolleys and everything in between. 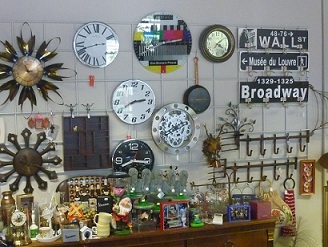 The shop is an unpredictable mix of old and new. The ground floor is packed with smaller items. There are vintage shaving mugs, old bottles and tools scattered among newer objects like clocks and Christmas decorations. 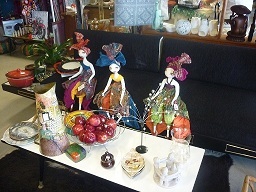 The upper floor is filled with furniture, some retro, some new, all well-designed and presented. Need a 1970's orange lounge suite? No problem. Or maybe a faux-metal industrial shabby-chic table and chairs would suit you better. There are also some wonderful tea sets including an ornate gilt one that has to be seen to be believed. On my first visit I bought some painted metal doves for Christmas ornaments and a set of framed wooden lizards (bright blue and orange). On my second visit, with a friend, we left with a cut-glass vase and some unusual printed paper napkins, and I have my eye on a few things for my next visit. 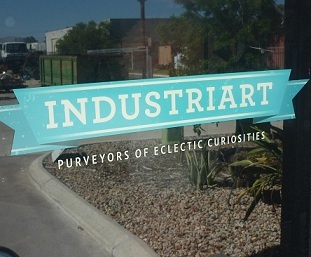 Industriart is a little way off the beaten track but is well worth a visit for that unique hard to find gift or decorating item. Thanks for the heads up! Certainly worth a visit. 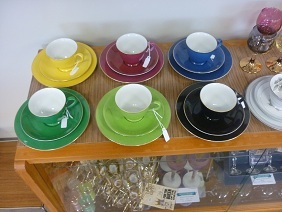 Make sure you allow yourself plenty of time to look at all the interesting, colourful, quirky collections. Veronica was a delight. I will certainly go back with friends in tow!